Our primary intention is to fit our services to your needs and to develop an individual package for you. The SocraTec family offers all services needed for modern drug development – from full service to modules individually tailored to meet your demands – our portfolio allows a broad pattern of solutions. We are large enough to ensure your project succeeds, yet small enough to be highly focused towards your goals. From early phase human pharmacology trials including FIM, classical PK and BABE trials to POC, our modern 60 beds CPU located in Erfurt achieves healthy subject trials and enables excellent patient recruitment via well-established and highly efficient networks. Thorough feasibility results in highly reliable recruitment prognoses even for difficult populations. 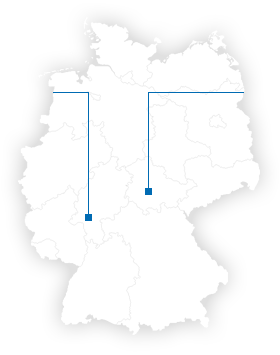 Thuringia offers an excellent environment for often astonishing patient recruitment rates. From feasibility analysis, site selection and patient recruitment to clinical monitoring, data collection and management via SocraMetrics, our range of services covers all relevant fields of phase II to IV. Our infrastructure is dedicated to national multi-centre trials and our network of partners also enables for international trials. Our strong experience in the field of OTC indications includes minors and children from the first year of life onwards with excellent recruitment rates even in Germany. Fitting to our claims and vision it is our intention to offer professional consultancy services completely independent from our CRO portfolio. This approach allows practical solutions for services not offered by the SocraTec family. That’s why SocraTec C&S is part of the family.